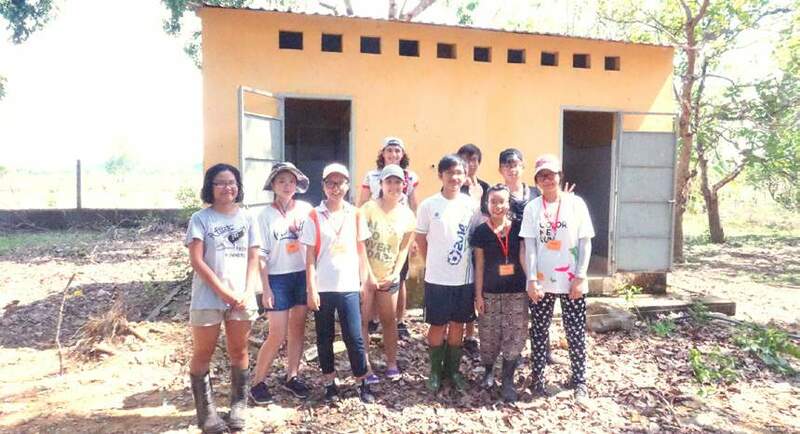 This spring, when Grade 11 students at the European International School Ho Chi Minh City learned that primary students in the ethnic minority village of Ta Lai had no functioning toilet at school, they decided to do something about it. Every Grade 11 student is required to complete a group CAS (creativity, activity, service) project as part of their International Baccalaureate Diploma Programme. When this year’s Grade 11 students learned that primary students in Ta Lai were missing school because they had to go home to use the toilet, they knew they had found their project. The funds enabled the students to purchase a pump and other needed materials. Then, at the end of May, they traveled three hours north to Ta Lai, just outside Cat Tien National Park. They spent a week living in a traditional long house, rebuilding the toilet and constructing a path and garden between the school and the new facility. With their remaining funds they bought school supplies to donate to the school. The European International School Ho Chi Minh City emphasizes innovation in its curriculum and extracurricular activities. The Ta Lai project challenged the Grade 11 students to perform many building tasks they had never tried before, such as painting, brick laying and installing tiles. European International School Ho Chi Minh City is an IB World School offering an academic and supportive English language education for students ages 2-18 years. For more information, please visit www.eishcmc.com or contact the school via email info@eishcmc.com / telephone number (+848) 7300 7257. BIO: Iain Fish is the Head of School at the European International School Ho Chi Minh City.